Somers, NY is a small Westchester County community about an hour’s commute from Manhattan. Because it is home to a number of artists and residents who appreciate good art, it is an ideal location for Somers Custom Framing, the full-service framing business run by custom-framing specialist Ken Ryan and his artist wife Ginny. Like many well-run framing businesses, the company has diversified in recent years. Along with expertise in conservation framing, Somers Custom Framing now offers an artful array of graphic design, photo-restoration, and wide-format printing services. For example, in addition to giclee printing, Somers Custom Framing can print photo enlargements on canvas which Ginny Ryan can hand embellish with over-painting or texturing. 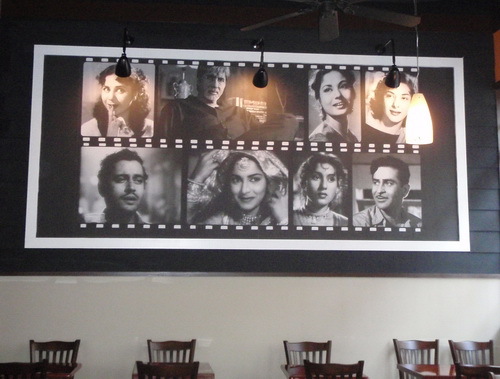 The 13 x 5 ft. photo mural that Somers Custom Framing printed on Photo Tex PSA fabric from LexJet helped restaurant consultant Bonnie Saran set the design stage for the Bollywood Bistro in Fairfax, VA.
Somers Custom Framing has also gotten involved in some retail décor projects. Recently, the Ryans worked with restaurant consultant Bonnie Saran to set the design stage for the new Bollywood Bistro Indian restaurant in Fairfax, VA. Working with Saran’s ideas, the Ryans created several film-themed murals using stills of some of the best-known stars in Bollywood. Using their Epson Stylus Pro 9800 wide-format inkjet printer, Ginny printed the murals in panels onto Photo Tex PSA, an inkjet-printable fabric that produces great image quality and is easy to put up and remove. No wall paste is needed and the material is water- and fade-resistant when used with the pigment inks. The largest mural in the Bollywood Bistro is 13 ft. wide and 5 ft high. “We printed the large scene in strips, which Bonnie hung side-by-side in a seemingly seamless fashion,” explains Ginny Ryan. Along with the main wall mural, Ginny produced seven additional 97 x 31-in. movie-ticket-themed prints on Photo Tex that decorate the entrance hallway and restaurant interior. She used other materials from LexJet to print a menu board and window signs with the same Bollywood filmstrip motif as the wall prints. For example, an Open/Closed sign was printed on a semi-matte photo paper from LexJet and mounted to foamboard with grommets at the top so it could be hung with a chain. 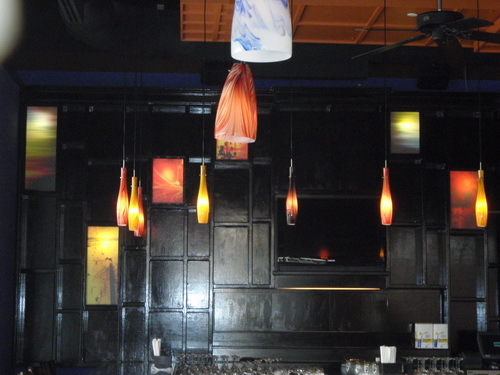 The graphics on the backlit cubes in the bar area of Bollywood Bistro are printed on LexJet 7 Mil Absolute Backlit film. For the menu board, Ginny used LexJet’s 8 Mil Production Gloss Photo Paper which was then mounted to foamboard for display in the restaurant’s front window. In addition, Ginny printed backlit graphics that complement the multi-colored lights that hanging from the ceiling from the restaurant. She printed the designs on LexJet’s 7 Mil Absolute™ Backlit film, which was then placed in several lit cubes that decorate the bar area. The Bollywood Bistro project wasn’t the first store-design art project that Ginny Ryan had produced for Bonnie Saran. Ginny hand-painted a mural for a gift store in Croton Falls, NY and helped produce indoor and outdoor signage for several other restaurant ventures. “For Bollywood Bistro, Bonnie described her vision to us and we came up with the best printing solution for her ideas,” explains Ginny. Whenever she was unsure which material to use for certain projects, Ginny Ryan called on LexJet account specialist Jennifer Hepner for advice. 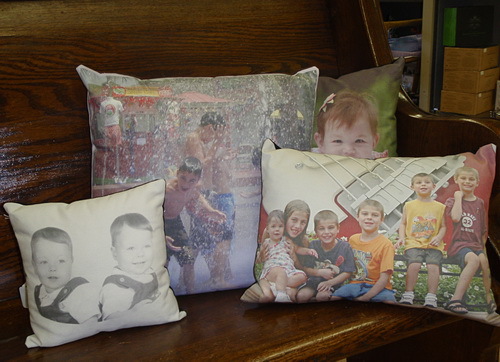 In their gift shop, the Ryans sell custom photo pillows created with inkjet-printable 3P Country Cotton FR from LexJet. Somers Custom Framing also uses inkjet-printable 3P Country Cotton FR from LexJet to produce three different sizes of photo pillows that they sell in their gift shop. Since launching the pillow designs eight months ago, they have sold more than 200 pillows. “Our ability to create, new exciting products using different materials by LexJet is a fantastic asset to the store,” says Ginny Ryan. You can some of the other products Ginny has created using LexJet materials in the next issue (Vol. 4, No. 9) issue of LexJet’s In Focus newsletter. If you ever happen to be in northeastern Westchester County, stop by Somers Custom Framing and see just how creative they have been in diversifying their services. Westchester Magazine recently named Somers Custom Framing a winner of a Best of Westchester® award in the category: Best Place to Frame (or Buy) Art. To learn more about some of the ways you can use a wide-format inkjet printer and materials from LexJet to diversify your imaging business, call one of the helpful account specialists at LexJet at 800-453-9538. Since 1994, LexJet has helped tens of thousands of business owners, photographers, artists, and designers prosper by helping them select the best digital-printing equipment, materials, software, and finishing systems for their operations. This is a creative idea, it looks like a neat style.